I’ll just come out and say it: Room Service is a bit overrated. Overpriced, and under seasoned, you never truly get the bang for your buck. In a fully furnished apartment, however, the options are endless. Take cooking into your own hands and discover how quick and easy it is to cook great food. For times you don’t feel like eating out or when you’re craving simple, healthy home-cooked meals, here’s a guide. Our kitchens are stocked with most appliances that allow you the liberty to dine in and feast on your own creations. Bon Appétit! Drink your way to a great day! Mornings are rushed enough, so here’s a recipe that will save you some time when you’ve slammed the snooze button one too many times. 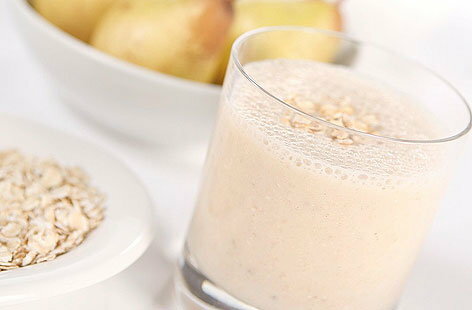 Blend up this delicious, yet healthy, breakfast smoothie that combines fruit and grain to give you a wholesome head start – the oats will easily keep you sated until lunchtime. Best of all, you can try different variations by switching it out with different fruits that are in season! 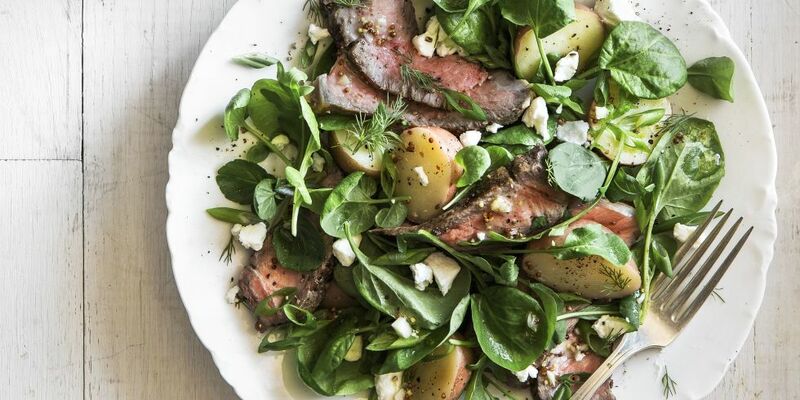 Here’s a lighter option to the original steak dish, but just as hearty and flavourful! A New York Strip is seasoned and seared, before being sliced and served upon a bed of lush greens. The addition of goat cheese and a zingy vinaigrette marry all the flavours into a delectable bite full. No fuss, no frills, and barely any dirty dishes, this delicious dish can be rustled up in under 30 minutes! Treat yourself to this sumptuous vegetarian stir-fry which features the shiitake mushroom known for its umami flavour and meaty texture. Combining the flavours of the Orient, this noodle main is seasoned with Hoisin and Sesame Oil that are staples of Asian cuisine known to pack a punch of flavour. Makes a great office lunch the next day too! Fish Tacos are the epitome of the Baja experience, and how wonderful is it that you can create this in the comfort of your (temporary) home? This humble Mexican delicacy is elevated by a zesty cabbage slaw in this recipe, and the fish is pan-fried rather than deep-fried to make it healthier. Serve it up in your choice of tortilla and you’re good to go! One of the best things to do with the versatile chicken breast is to stuff it, so it retains its moisture and absorbs the flavours of the stuffing. This recipe infuses Greek flavours into the chicken dish, and will leave you wondering how on earth you could end up with so much depth of flavour with only seven ingredients in under 30 minutes! Also keep in mind that it’s a great meal to serve to unexpected dinner guests! Hotel rooms only give you so much, but a stay in a CorporateStays furnished apartment might help you discover your inner chef de cuisine – it’s all in the experience! Write to us and let us know how it turned out! For more recipes, make sure to check out our other food oriented articles!